IN A sign the powerful road lobby has accepted the need to reduce car use, the state's main motoring group has unveiled a plan to turn one of Sydney's most congested and blighted roads into a public transport corridor. In return, the NRMA wants the NSW government to build the 8.5-kilometre M4 East under the suburbs between Concord and the city. The NRMA argues removing much of the traffic - especially trucks - from Parramatta Road and putting it underground, would transform the road into a boulevard of ''transit-oriented development'', lined with medium-density housing, shops and cafes. 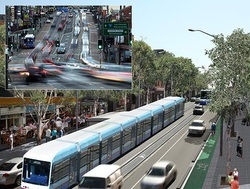 Under the plan drawn up by one of Australia's leading urban planners, Ed Blakely, there would be two lanes for light rail along the middle of Parramatta Road, as well as a cycleway and two lanes for slower-moving local traffic. The plan would allow for the building of at least 23,000 flats along the corridor between the city and Strathfield and the upgrade of what planners call a classic ''traffic sewer'' - a noisy, congested and polluted artery that divides neighbourhoods. From the mid-1990s, there have been at least five proposals to rehabilitate Parramatta Road. The then Inner Metropolitan Regional Organisation of Councils sought $400,000 from the federal government to fund a four-year upgrade. Two years later, councils presented a plan, ''Parramatta Road, 2000 and Beyond''. In 2002 a consortium of architects, landscapers and engineers, called the Sydney Central Team, won an international competition for ideas to overhaul a 23-kilometre strip of ''decay and unrealised potential smack in the middle of the demographic heart of Sydney''. The NRMA estimates the cost of building the M4 East tunnel, laying the light rail, preparing a cycleway and upgrading the streetscape would be $7.4 billion. But the organisation calculates that, over 25 years, the government could raise $10.8 billion from the development, including close to $6.8 billion through stamp duties. Motorway experts welcomed the plan to reduce traffic on Parramatta Road but consider that the M4 East would increase congestion for the Anzac Bridge at Rozelle, which is already close to capacity. Michelle Zeibots of the University of Technology, Sydney, said Parramatta Road would be likely to become ''a feeder route'' for the M4 East, especially around the entry and exit portals at Strathfield, Lilyfield and Chippendale. ''In the past, extensions to the M4 have led to induced traffic growth and put pressure on the surrounding roads,'' she said. In its metro strategy, the NSW government identifies Parramatta Road as part of an ''enterprise corridor'' to be ''considered as part of any planning of an extension of the M4 motorway to reduce congestion on Parramatta Road and strengthen connections between western Sydney and Sydney CBD and Port Botany''. Sandie Bizys, the owner of Sandie Bizys Hats & Vintage in Stanmore, has been in business on Parramatta Road for 10 years.